BEIJING -- China said Thursday that 15 foreign ambassadors exceeded their diplomatic roles by issuing a letter expressing concern about the incarceration of hundreds of thousands of members of the country’s Muslim minorities in reeducation camps. 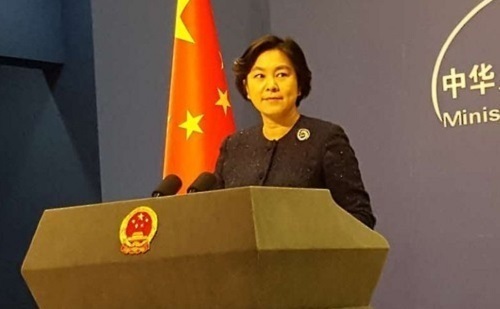 Foreign Ministry spokeswoman Hua Chunying told reporters at a daily briefing that it would be ``problematic’’ if the diplomats were attempting to put pressure on local authorities in the northwestern region of Xinjiang, where the detentions have taken place. ``As ambassadors, they are supposed to play positive roles in promoting mutual understanding, mutual trust and cooperation ... rather than making unreasonable requests to the countries where they are based,’’ Hua said. She said the letter issued this week and reportedly spearheaded by Canada was based on hearsay, despite widely distributed reports from detainees, relatives and officials documenting the sweeping and seemingly arbitrary detentions. Inmates and relatives say the camps impose military-style discipline and punishments and force detainees to renounce their religion and culture while swearing fealty to President Xi Jinping and the ruling Communist Party. Asked about the letter, Canadian Prime Minister Justin Trudeau said he had ``highlighted the questions and concerns that we have’’ surrounding the issue in his bilateral meeting with Chinese Premier Li Keqiang on the sidelines of the annual summit of the Association of Southeast Asian Nations in Singapore. ``Canada will continue to look for ways to advance and promote human rights in partnership with our likeminded allies everywhere around the world,’’ Trudeau said at a news conference Thursday. The letter to the Chinese government has not been made public, but the Reuters news agency said it was signed by 15 Western ambassadors, including the Canadian, British, French, Swiss, European Union, German, and Australian envoys. Diplomats from the countries named in the report either did not reply to requests for confirmation or said they had no comment. Hua’s comments came as a bipartisan group of US lawmakers is bringing a measure to urge President Donald Trump to help Chinese Muslims respond to the crackdown. The legislation would urge Trump to condemn ``gross violations’’ of human rights in Xinjiang, where the U.N. estimates that as many as 1 million Uighurs and other predominantly Muslim minorities are being held in arbitrary detention. It would also support an existing push for sanctions against Xinjiang Communist Party chief Chen Quanguo and other officials under the Magnitsky Act, which prevents foreign officials from entering the US and freezes any assets they have in US banks. Other sanctions raised for consideration by the act include a ban on sales of US-made goods or services to Xinjiang state agents such as those that could be used for surveillance and suppression. Xinjiang’s native Uighur and Kazakh ethnic groups are culturally, religiously and linguistically distinct from China’s Han majority and the region has been home to a low-intensity rebellion against rule from Beijing. Many of the region’s natives say their culture is under threat from Chinese policies aiming to assimilate them and that they face disadvantages in education and employment from Han migrants from other parts of China. Members of the Muslim Hui ethnic group -- culturally and linguistically closer to the Han -- have also been ensnared in the campaign that has drawn comparisons to Mao Zedong’s radical 1966-76 Cultural Revolution.